This article is special, since it’s an article concerning a project one of my sisters have been working on for a long time! All of us Jones kids are talented, and that includes my sister Ashley M. Jones. She’s not only a highly-respected teacher at Birmingham’s fine arts high school and an accomplished poet, but she’s also the director of the inaugural Magic City Poetry Festival in Birmingham, AL, taking place during the first week of April (starting today! ), which also coincides with National Poetry Month and the 50th anniversary of the assassination of Rev. Dr. Martin Luther King, Jr.
For those not in the know, Miami isn’t the only city in America that has the named “Magic City.” I can’t speak for Miami, but Birmingham acquired the nickname because of its ability to develop after virtually nothing (the city is also one built after the Civil War, which might lend more emotional resonance to its nickname). It’s this name and this history that fuels much of my sister’s work–her first book of poetry is called Magic City Gospel, after all–and that name also fuels this poetry festival, which is all about celebrating southern poetry and southern wordsmiths. BIRMINGHAM, AL MARCH 25, 2017– The Magic City Poetry Festival will celebrate the role of poetry and writing in Birmingham’s history. Set to take place during the first week of April, National Poetry Month, the MCPF will also feature a panel on the 50th anniversary of the assassination of Rev. Dr. Martin Luther King, Jr., commemorating this tragic moment in American history. On Wednesday April 4th, from 6-8 pm at the Birmingham Civil Rights Institute, author Kiese Laymon and poet Jacqueline Trimble will discuss the role the media has played in the representation or misrepresentation of Birmingham and the American South and the progress (or lack thereof) we’ve made. The media had a lot to do with the passing of the Civil Rights Act in 1965 because of the national coverage of the Birmingham Campaign of the Civil Rights Movement, but that same media has either held the South in suspended animation. That is, we are either shown as backwards and rigidly conservative or, in the case of Birmingham, we are shown as a beacon of completion as it relates to the Civil Rights struggle. How can the South navigate these misrepresentations to make way for real progress, and how can it serve as an example or a radar for the US’ progress at large? We invite local journalists and activists to attend this important event engaging local history. 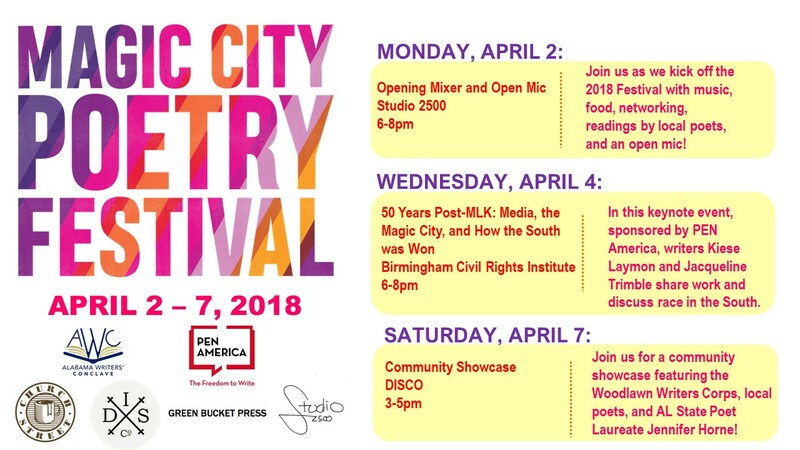 On Saturday, April 7th, Alabama State Poet Laureate Jennifer Horne will be among the readers at the Magic City Poetry Festival Closing event from 3 to 5 pm at D.I.S.C.O. in Woodlawn. All events are free and open to the public. Co-sponsors and donors include PEN America, Alabama Writer’s Conclave, Alabama State Poetry Society, Barry Marks, Church Street Coffee, Studio 2500, Naked Art Gallery, Desert Island Supply Co., and Green Bucket Press. For a full rundown of events, visit the Alabama Writers’ Conclave. Every event at the festival is free, but note that for the MLK discussion at the Civil Rights Institute, you’ll need a ticket (so Ashley and the festival organizers can have a head count of how many will be in attendance), so make sure to reserve your ticket at Eventbrite. Follow the festival’s Facebook page for more information!